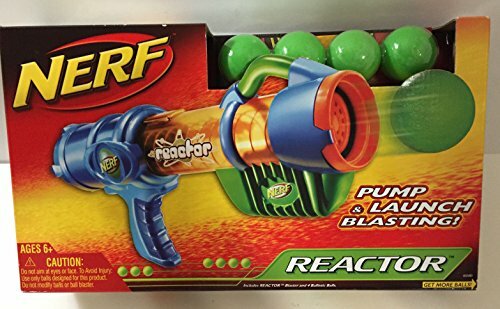 The Reactor launcher blasts out Nerf Ballistic Balls everywhere you take aim! The awesome pump-and-pull action keeps the fun fast and furious! Just load the balls into the see-through barrel, take hold of the comfortable hand-grip, and start blasting! It's awesome, load-and-launch action you can only get from Nerf! Hint: click or tap the stars for the most helpful Nerf Reactor Amazon reviews. Nerf Reactor mod kit & step-by-step guide coming (very) soon. Click here to be the first to know when it's ready! Nerf Reactor range test coming soon! Get the Reactor Mod Guide!